Slasher flicks should always be rated R. It should be a truth universally accepted by every living being in the entire history of living beings. What fun is a slasher flick without fun deaths and gratuitous violence? Nobody cares about the characters in these things; audiences just want to have their blood lust satiated. It's the entire point of Drew Goddard's classic deconstruction of the entire horror genre, Cabin in the Woods. So why is Happy Death Day bothering with a PG-13 rating? What's a slasher film without blood? Doesn’t that make it an average, run-of-the-mill film? After getting murdered by a killer in a creepy baby mask, Tree (Jessica Rothe) wakes up to find that she's stuck reliving the same day over and over until she can ID said murderer. Tree goes through the suspects one by one, dying each time she's got it wrong. It's Groundhog Day, but for the slasher genre. Things get kicked up a notch for Tree when she realizes each death is leaving a permanent scar, giving her a somewhat finite amount of deaths before she dies for real. The good part about Happy Death Day is its very much aware of its ridiculous premise. Everyone is in on the joke, especially Tree, which makes for some silly fun. Working her way through potential suspects, dead-ends are met with a shrug as they each end with her death. It’s just a shame those deaths are mostly uninspired and blood-free, partly due to the film’s PG-13 rating. Happy Death Day still could’ve gotten a little creative with the deaths, as the similarly-themed and PG-13 rated Edge of Tomorrow had all sorts of fun killing Tom Cruise over. And over. And over. Despite not having enough “awesome” deaths, Happy Death Day is mostly fun, at least until the third act. That’s where the PG-13 rating really hurts, since things break down into a typical slasher genre third act with the killer chasing the heroine. 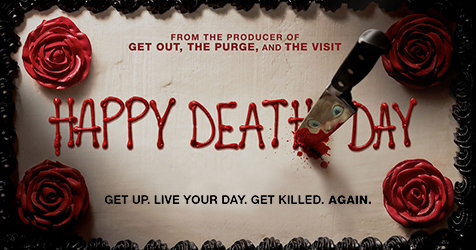 Happy Death Day tries to put a spin on the killer’s identity, but it’s pretty easy to guess who the killer is within the first 20 minutes. Happy Death Day doesn’t break any ground in the slasher genre, but it’s breezy enough entertainment. The premise also leaves open the opportunity for oodles of sequels, a la Final Destination. If there is a Happy Death Day 2 though, hopefully it will embrace a R-rating.